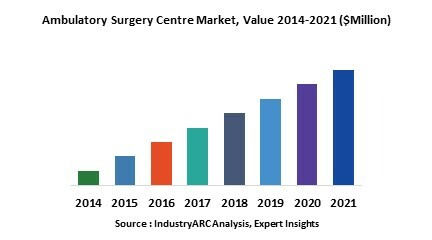 The global Ambulatory Surgery Centers (ASCs) market is estimated to generate revenue of $7,657m by 2023, growing at a CAGR of 3.5% during the forecast period 2018–2023. New developments in medicare procedures, affordability, and increase in the number of ambulatory surgery centers (ASCs) are the major growth drivers for the global ambulatory surgery centers market. ASCs are modern healthcare facilities where surgeries are performed in fully equipped operating rooms under the care of highly skilled physicians and nurses. These centers primarily provide treatment to patients that do not require admission to hospitals for treatment. The treatment can be performed outside the hospital premises, and the patient can be immediately discharged after accomplishment of medical procedure. Ambulatory surgical centers are cost effective for people who cannot afford huge medical bills. In this report, the global ambulatory surgery centers market is segmented on the basis of location, type, services, surgery, and geography. Based on location, the global ASCs market is divided into urban, and rural. Based on type, the global ambulatory surgery centers market is bifurcated into hospital-based ambulatory surgery centers, and free-standing ambulatory surgery centers. Based on services, the market is segmented into laceration treatment, bone fracture treatment, emergency care service, and trauma or accident treatment. Based on surgery, the market is categorized into cataract surgery, orthopaedic surgery, endoscopic procedure, gastroenterology, urological procedure, vascular surgery, pulmonary surgery, pain management, and others services. The market is further segmented into major regions – Americas, Europe, Asia-Pacific (APAC), and Rest of the World (RoW). A detailed analysis is also given for all the major country-level markets in each of these regions. The advancements in medical technology and affordability of facilities are driving the growth of the ambulatory surgery centers market. Cost savings, patient satisfaction, convenient locations, and technological advancements offered by ASCs are impacting the growth of the ambulatory surgery centers market. Ambulatory surgery centers provide cost effective services and amenities, and also offer convenience to the patients who are willing to undergo day surgery. The evolution of less invasive surgical techniques such as arthoscopy, laparoscopy, and others have resulted in the rise in the number of procedures that can be performed in ASCs. In June 2018, KKR, a global investment firm, entered into a definitive agreement with Envision Healthcare, a company that owns and operates 216 ASCs in the U.S., to acquire the latter for approximately $9.9 billion. The deal is expected to close in late 2018.
Who are the Major Players of the Ambulatory Surgery Centers Market? The major companies referred to in the market research report include AmSurg Corp, Tenet Healthcare, Surgical Care Affiliates, Surgery Partners, and United Surgical Partners International Inc.